Sudbury was opened in 1968 (see details of original transmitter) for the transmission of BBC2, then BBC1 & ITV were added in 1970 before Channel 4 came along in 1982. The figures for the mast heights vary according to which source you look at, but I reckon the mast height for the original TX is about 140m (a.g.l) with the aerial array (covered by its fibreglass shroud) on top of that, possibly another 20m. The second of the structures, the one transmitting digital, is around 130m in total height, see How High is High ? The site height is 70m and the TX is located about 14 miles WSW of Ipswich. Sudbury Transmitters from the South. The original Sudbury transmitter is on the right and the supplementary transmitter on the left. Ahhh, so they are different heights ! Sudbury`s two masts from a point exactly equidistant from both of them. The fact they`re bending inwards is obviously down to the wide angle lens, not some new fangled engineering technology. The fact the picture is of low quality was down to the lighting conditions, but I`m not going all the way back just for one photo ! Sudbury was originally a B group before the advent of Digital, it then went E group, before becoming a K group, which is actually quite close to being its original B group ! There are no interleaved spectrum channels allocated to Sudbury in the latest scheme. A slight chance exists of more TV channels being transmitted between CHs 31 and 37. 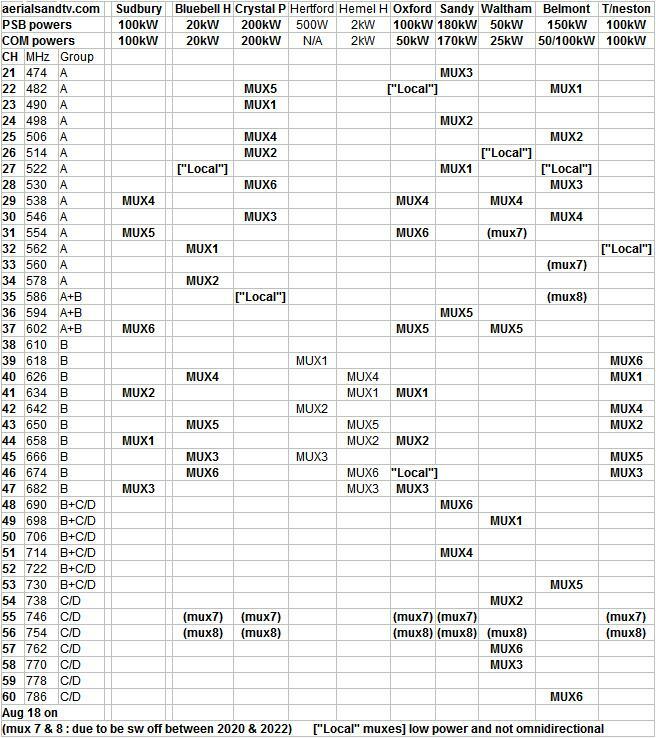 All these channels can by picked up by K group (or decent E groups or widebands). Those situated to the West of Sudbury may find that during certain weather condition they can suffer from co-channel interference as their aerials are pointing towards the continent. 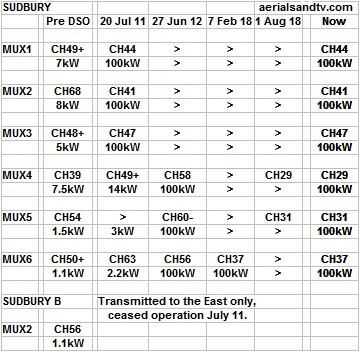 700MHz clearance is due at Sudbury on the 1st Aug 18. It is due to change from an E group to a K on CHs 29 to 47. However, most aerials which worked before will continue to work. Note the huge power increase at the 2011 digital switchover. Sudbury is horizontally polarised and was originally a B group before the advent of Digital, it is now an K group. Sudbury has eight small repeater transmitters off it. This is one reason why your signal may have got better after switchover ! Above left we have Sudbury`s pre DSO transmitting antennas from the West, and above right a picture taken from the East. Post DSO, from July 2011, the PSB MUXES will be transmitted from the (omni-directional) analogue antennas. The main original mast (the slightly taller one) will transmit the three PSBs, and, from June 2012 the three COMs at full power as well. Until then the COMs will be broadcast from their original antennas on the (slightly shorter) supplementary mast. When switchover is fully complete the second mast will become the COM reserve. 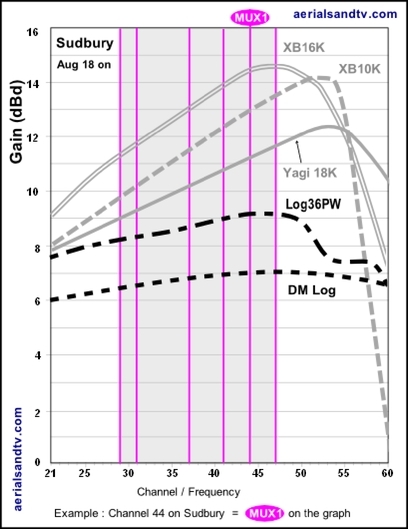 For Sudbury we recommend the DM log for strong signal areas, the Log36 for medium signal areas, and the Yagi18K or XB10K for poor signal areas, the latter aerial being particularly well suited to loft mounting. The XB16K is for those with the most marginal signals. The dimensions and test performance of the aerials can be found on the relevant tables. The guide below also includes the same information for other potentially co-receivable transmitters within Sudbury`s coverage area, namely, Bluebell Hill, Crystal Palace, Hertford, Hemel Hempstead, Oxford, Sandy, Waltham, Belmont and Tacolneston. The Channel Allocation Guides can be very useful in the diagnosis of co-channel interference problems and can also be invaluable if you are trying to find a spare channel for a modulated output (e.g. for a Sky box or CCTV system) to be added to your TV setup/distribution system without suffering from co-channel. Also check Sudbury`s eight small repeater transmitters. Sudbury is a pretty powerful transmitter, specifically the joint eighth most powerful in the country.